It's 1:00 p.m. in Israel and for the next month, I will only be 6 hours behind the States! Last night, we changed the clocks back and hour. Fortunately, that was a blessing since I didn't get off the phone with my friends until 3:30 a.m. new time. First of all, I'd like to thank everyone for their birthday well wishes. Much appreciated! It's sad that I can't celebrate with y'all, but I'm happy that at least most if not all of you remembered. This morning, I was woken up at 7:30 a.m. by my cell phone. I got a text message. Thinking it was a birthday text from some one in the states, I went to check it. It was Yanai, the guy I hung out with last night, telling me that he was driving into Jerusalem to visit a friend's father who is in Shaarei Tzedek and very ill, and would I like a ride to Jerusalem. I literally jumped out of bed, thinking this was certainly bashert and called him back. He said he would pick me up in 30 minutes, which gave me plenty of time to take out my Kotel outfit (longer jean skirt I own, long-sleeve black t-shirt) and get ready, plus I was able to daven a bit at home, eat breakfast and cathc up with Cara Rochwager back home. He picked me up at 8:30 and we were swiftly on our way to Jerusalem. The road was basically clear until we got to the entrance of Jerusalem, where the traffic really backed up. Yanai told me that a lot of people go to visit graves of relatives on Erev Yom Kippur, so the backup were all the cars trying to get into the cemetary at the entrance of Jerusalem. Since he stil hadn't heard from the friend in the hospital, he drove me all the way to the Kotel! We went through the Old City, entering at Jaffa Gate, and he dropped me off right outside the entrace to the Kotel. I really couldn't believe it - I finally made it to the Kotel. And, on my birthday too! 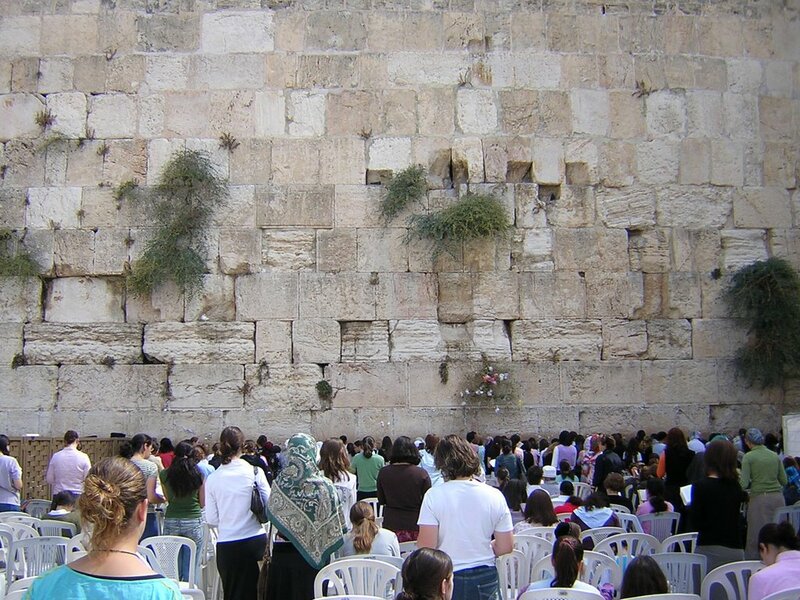 The Kotel was teeming with people, and I was able to finish davening Shacharit, say my tehilim, say my own little prayer for myself, my family, and my friends and then I did Kaparot at the Kotel! That was really great, I found 4 quarters in my camera case (which is what I use when I'm home in Queens for Kaparot) and I said it while standing right near the cool stones. Since the time was ticking and I still had to get back to Tel Aviv and prepare food for tonight, I only stayed for 30 minutes at the Kotel. On my way out towards the parking lot, I was able to give out the Sheliach Mitzvah money that I got from the folks at home (Rachel, Ilana, Marns, the Torcz's, Cousin Neil, Seth and Allison, Josh Dyckman and anyone else who gave me money to give out, it was given today and the blessings from the women in need were said in your honor!). Above is a photo of the Kotel on Erev Yom Kippur. I walked out the gate, and past the Chabad guys who were doing Kaparot with a real live chicken, deposited my quarters into their Tzedakah box since they were collecting money in return for the chicken schlugging and I hopped a cab to the Tachanah. I have never actually been inside the new Tachanah before and it's incredible!!! I was amazed at how many restaurants and how beautiful it looks! I ran inside and up to the third floor to buy the ticket for the bus to the Arlozorov station and he told me that the bus was loading right then and there. I had to go to the bathroom though so I made a break for it and, one shekel later, was racing back towards the bus. Now, I am blaming the following on only 3 hours of sleep last night, but I didn't see the bus that was RIGHT IN FRONT OF ME! There were people sitting on the bench waiting, so I just sat there and waited with them. I kept looking at my watch because the bus was said to depart in 4 minutes, so I couldn't understand where it was. Then, I finally looked up and realized that the bus people were getting on for the past 15 minutes was the 480 bus. I hopped on and the driver shut the doors LITERALLY behind me. Oh well, at least I didn't have to wait that long on the bus. I grabbed a seat in the back and settled in for the ride back, which was absolutely gorgeous. Israel is just such a beautiful country. I was surrounded by Chayalim and, at one point, realized that I had 3 guns pointed in my direction. That was an interesting feeling. And then, the texts and birthday calls came in. I got a call from Maayan over at my gym, she offered me a Mazal Tov but when I asked for a free month in honor of my birthday I just got a laugh from her. Then, I got a text from this guy I'm supposed to be going out with at the end of October. It was so sweet of him to remember, I don't even know when I initially mentioned it to him, so that was nice to received. Then Jeff called again to wish me a Happy Birthday and to invite me to a pre-fast Seudah. Since the other option was to eat alone, and to eat boiled potatoes and chicken that I still had no idea where I was going to go to get, I thankfully accepted the invitation. I got off the bus a few moments later and grabbed a cab towards Supersol, where I picked up some food to break the fast tomorrow and a bottle of wine for my host/hostess this afternoon. We are eating at 3:30 since the last time you can eat is 4:45. I was going to go there all ready for shul, but just realized I have to come home to light candles. So, I don't think I'm going to go there all dressed, but will lay everything out so all I have to do is change when I get back home. That's pretty much it. I know time is tight with everyone, so if I don't speak to you before the fast, have a Gmar Chatimah Tovah and an easy and meaningful fast! For all of my expecting friends in the States, please be extra careful! And to Hannah - happy EARLY birthday! I can't wait until you get here in a few days so we can celebrate our birthdays together! 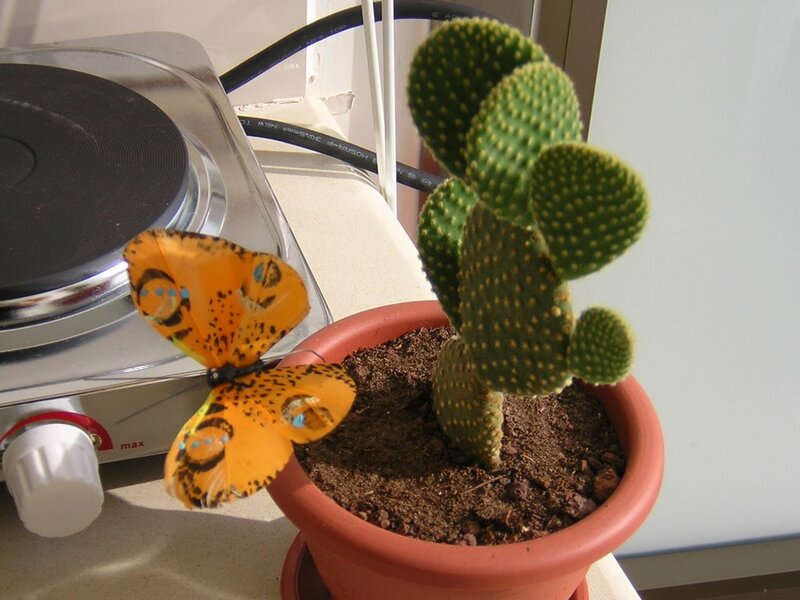 Follows is a photo of my Birthday cactus, courtesy of Jeff. Cuch - please send me an e-mail with how to take care of this thing! I've never had a plant in my life, and I know you have a nice green thumb. Song of the Day is May It Be by Enya. Because it's nice and soft and puts one into the right frame of mind before tonight.